The Lore of Ramridge is now up for pre-order on Amazon! Everyone who pre-orders the ebook will automatically receive it on the day it is published, June 15. Please feel free to leave a review once it is officially published! Thank you so much to everyone who has brought us this far! I am so excited! 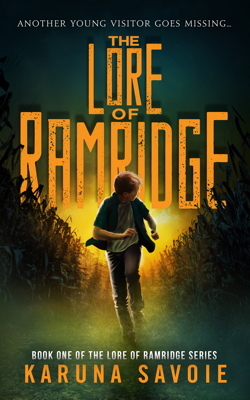 James’s eerie disappearance in Ramridge Ranch’s corn maze sets off a hair-raising hunt for his rescue. Parker Wright, the ranch’s enraged caretaker, teams up with the local sheriff to search the farm. But the corn maze muddles and confounds all of its occupants save the creepy kidnapper himself. James soon comes face to face with his captor and the dark truth that he is not the only captured child. Disobeying his mother to visit the farm has been the worst mistake of James’s life! Will Parker and the sheriff uncover the unsettling truths of the maze in time to rescue James? Or, will James find the determination, cleverness and courage to save them all?